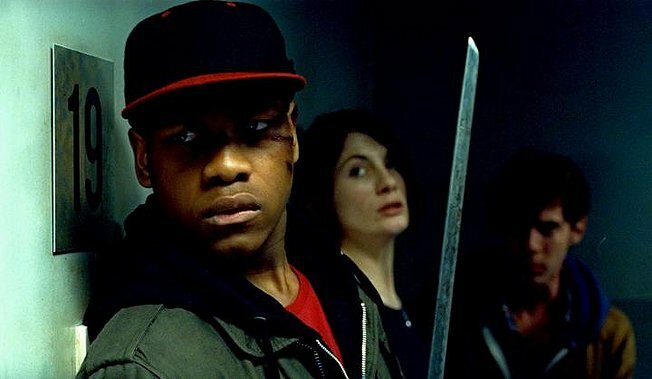 Starring: John Boyega, Jodie Whittaker, Alex Esmail, Nick Frost, and Luke Treadaway. Rated: R for the stuff wanna be gangsters do, as well as heavy sci-fi violence. In the usual alien invasion movie, we are privileged to see the response of the few and the proud that have the capabilities of taking on the evil invaders: the secret lairs of the Men in Black, the faithless preacher rescuing his family in Signs, or the president in a fighter jet in Independence Day. But what about those who don’t even register on our radar during such an attack? The nobodies living on the fringe of society, who are often the extras being thrown around by explosions? That’s the premise for Attack the Block, a British dark satire set around an alien invasion in South London. Our heroes are not the people we usually identify with; they're petty thieves who aspire to be gangsters, and use slang that is more or less incomprehensible. While it’s not the most unique premise in the world, director Joe Cornish treats it with gusto and satire, with more laughs than scares and more thrills than themes. Mr. Cornish weaves his camera through the dark alleys, making for a night of havoc across the streets of London. The opening is pitch perfect absurdity, not far from the vein of Edgar Wright, who helped produced the feature (Nick Frost also has a small role as a drug dealer). Sam (Jodie Whittaker), a twenty-something nurse living in a bad neighborhood finds herself being mugged by a group of thugs, when a crash from the sky allows her to escape. Moses, played by the young and stern John Boyega, searches the wreckage, only to find himself scratched by a creature. Not wanting to let go of his pride, the gang hunts down the creature, taking it as a prize and dragging it across the neighborhood. But bigger creatures show up, and these ones will take more than a small switchblade to handle. Mr. Cornish’s alien design is simple—they look like gorillas with pitch black fur and neon teeth that scream with a high pitch intensity. The gang finds themselves outnumbered, and soon teaming up with Sam and anyone else who can help (except the police, who think Moses and the gang are responsible for the havoc). 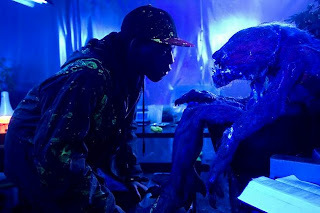 From there, Attack the Block develops into a more or less series of horror thrills with a sci-fi twist and a satiric tone. The trick is Mr. Cornish’s stylistic touches: the brooding dark corners, the simplicity of the action sequences, and the constant comedic yammering of the gang’s only white member, Pest, played brilliantly by Alex Esmail. Mr. Cornish doesn’t have the same freakish energy or inventiveness of Mr. Wright, but he has a knack for classical storytelling that pays off with simple pleasures. He uses gratuitous blood to great effect, but never in a gratuitous way. He knows how to balance the banter of his actors (especially with a female counterpart gang we meet later) with the darkly horrific premise. 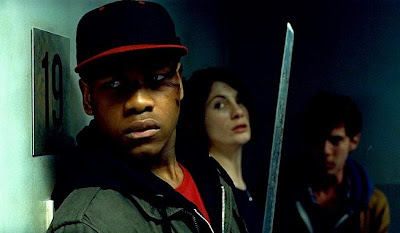 While I don’t think Attack the Block is perfect by any standards—it’s too meandering and it’s editing has the feel of an assembly cut at points—it’s another reminder that a good movie in any genre is not dependent on the size of the budget, but the brains using that budget. Mr. Cornish has already been courted by Hollywood (he’s in running to direct the pointless Die Hard 5), and let’s hope that he keeps his projects small, but in brains big. That is, unless an alien ape eats it along the way.